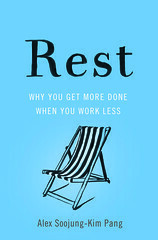 One of the pleasures working on a book like REST is that it provides a great excuse to read about the lives of all kind of fascinating people, and to learn how they organized their lives to do their best work. In this 1981 interview, Caltech physicist, co-inventor of quantum electrodynamics, and Nobel laureate Richard Feynman talked about how he made sure he had time to think about difficult problems. To do high, real good physics work you do need absolutely solid lengths of time, so that when you’re putting ideas together which are vague and hard to remember, it’s very much like building a house of cards and each of the cards is shaky, and if you forget one of them the whole thing collapses again. You don’t know how you got there and you have to build them up again, and if you’re interrupted and kind of forget half the idea of how the cards went together—your cards being different-type parts of the ideas, ideas of different kinds that have to go together to build up the idea—the main point is, you put the stuff together, it’s quite a tower and it’s easy [for it] to slip, it needs a lot of concentration—that is, solid time to think—and if you’ve got a job in administrating anything like that, then you don’t have the solid time. This is a point I make in my book: Even at a place like MIT or Caltech there are committees to be filled, guests to be escorted around, students to be taught (oy the students), articles to be peer-reviewed, etc. etc. ad infinitum. The world never gives you time to rest, or time to think deeply. You have to take it. So how did Feynman take it? So I have invented another myth for myself—that I’m irresponsible. I tell everybody, I don’t do anything. If anybody asks me to be on a committee to take care of admissions, no, I’m irresponsible, I don’t give a damn about the students—of course I give a damn about the students but I know that somebody else’ll do it—and I take the view, “Let George do it,” a view which you’re not supposed to take, okay, because that’s not right to do, but I do that because I like to do physics and I want to see if I can still do it, and so I’m selfish, okay? I want to do my physics.